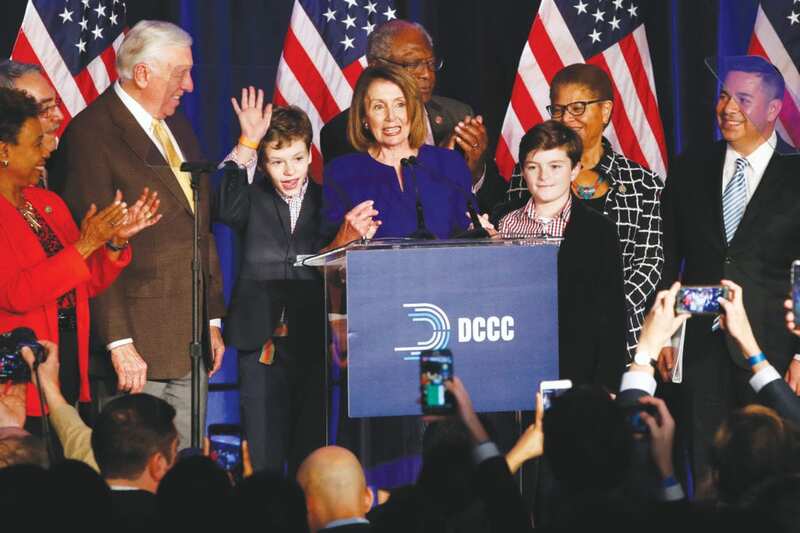 AP Photo House Minority Leader Nancy Pelosi of Calif., center, speaks between two of her grandsons and Congressional Democrats as they celebrate Democratic wins in the House of Representatives to a crowd of Democratic supporters during an election night returns event at the Hyatt Regency Hotel, on Tuesday, Nov. 6, 2018, in Washington. At left of her grandson is House Minority Whip Steny Hoyer, D-Maryland. WASHINGTON (AP) — Democrats were gaining significant ground in the battle for House control Tuesday night, while Republicans held their Senate majority as voters rendered a mixed verdict in the first nationwide election of Donald Trump’s turbulent presidency. Yet Democrats’ dreams of the Senate majority as part of a “blue wave” were shattered after losses in Indiana, Tennessee, North Dakota and Texas. They also suffered a stinging loss in Florida, where Trump-backed Republican Ron DeSantis ended Democrat Andrew Gillum’s bid to become the state’s first African-American governor. Democrats won half the seats they needed to claim House control with dozens additional competitive contests remaining. Victories in contested races across Florida, New York, Virginia, Pennsylvania and Minnesota gave them cause for optimism. Trump sought to take credit for retaining the GOP’s Senate majority, even as the party’s foothold in the more competitive House battlefield appeared to be slipping.